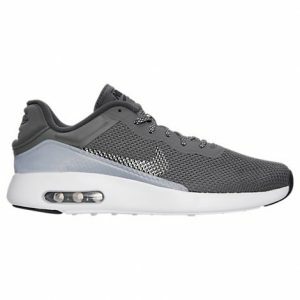 Finish Line has a Nike Air Max Modern Mens Running Shoe Sale, $49.98, free in store pickup where available, otherwise $6.99 shipping. Expires Soon - $95+ at Amazon. In Dark Grey/Reflective Silver/Black - Other colors cost more. This shoe beautifully blends a textile and mesh upper with a no-sew overlay for a sleek look. Comfort isn't an issue either as a molded collar and tongue help to offer plush cushioning, while the Max Air unit in the heel offers that familiar feel.